Comparing the first table with the second, you can see that educated Americans are much more liberal than Americans overall. More than three times as many educated Americans favor open borders (21.8% versus 6.8% say we should let anyone in). Average Americans are almost twice as likely to want strict limits imposed. While the first table shows how conservative Americans are, the second reveals that educated Americans are more liberal than their counterparts in other developed countries. Only Sweden and Switzerland look to be more liberal. This analysis suggests that the divide between the more and less educated in the United States is larger than in many other countries. While regular Americans focus on the costs of immigration, educated Americans buy into the America-is-a-nation-of-immigrants propaganda. It may be that both for regular Americans and for elites, the opinions expressed here reflect their actual self-interest. Regular Americans are hurt by large-scale immigration. The elites, on the other hand, can insulate themselves from many of immigration's harmful effects while benefiting from cheap labor. For 200 years our country was unique in the world in that we were governed by an elite that actually had our interests in mind, most of the time. Unfortunately, we are now headed toward what has been the historic norm for most places, through most of history: being ruled by an elite that the despises the people they rule over. 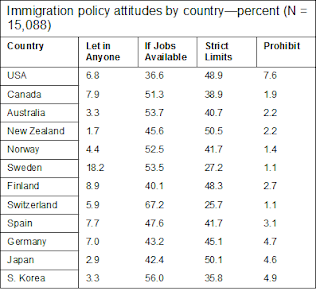 I'm surprised that New Zealand is notably more conservative than most European nations. Its largest immigrant groups are relatively easy-to-assimilate Pacific Islanders, not difficult- or impossible-to-assimilate Muslims as in Europe. A college degree in America is basically four years of left-wing indoctrination. In most other countries a college education is still just that, rather than being a fairly explicit program of thought and behavior modification. "I'm surprised that New Zealand is notably more conservative than most European nations. Its largest immigrant groups are relatively easy-to-assimilate Pacific Islanders, not difficult- or impossible-to-assimilate Muslims as in Europe." Perhaps it makes sense in light of Auster's Law of Majority-Minority Relations. When immigrants are well-behaved and successful, you can have a rational conversation about them. On the other hand when immigrants behave badly a contingent arises to make excuses for them and gets hysterical at the slightest hint of criticism. You could also look at it as signaling value. You can't morally posture about immigrants who are doing fine and not directly bothering anyone. When immigrants misbehave and are an obvious detriment to society, you can burnish your holier-than-thou bona fides by sticking up for them. Is there data for american with graduate degrees? IRfW - "Unfortunately, we are now headed toward what has been the historic norm for most places, through most of history: being ruled by an elite that the despises the people they rule over." I agree - my interpretation is that in the past the elite felt bound to the masses by a common religion; then when religion declined or became diverse the elite were unified with the masses by nationalism/ patriotism; then when nationalism/ patriotism was suppressed (post WWII) there was *nothing* to unite the elite with the masses. Of course, things continued, dwindling, for a couple of generations by sheer inertia, but in the end... well, here we are! In the U.S., blacks tend to be less educated, as well as anti-immigration. How do the results (support for immigration vs education) break down by race? Is the width of the gap an artifact of differential support by race? Harder question - is the black antipathy to immigration a function of their lower education, and the perceived economic competition from immigrants. I'm with Josh. Too many Americans (something like a quarter) have college degrees. You want the elite, look at graduate degrees. You want to make sure you get MBAs and JDs in there, they hold most of the power positions. Anonymous said that if immigrants are "well behaved" there are few issues. Whats the defination of well behaved? Asians and South east Asians are mostly well adjusted, economically well off and educated, yet they are often the victims of numerous hate crimes. I think its the reverse, when the natives of a host country are well behaved, there are few clashes with immigrants. "when religion declined or became diverse the elite were unified with the masses by nationalism/ patriotism; then when nationalism/ patriotism was suppressed (post WWII) there was *nothing* to unite the elite with the masses." A little late to the table, but I would also point out the suppression of socialism, which is pretty much the politics of caring one another (although it can be subverted), and the promotion of capitalism, which being about competition and can, as we all know, get dirty. The medium fastened on top of Hoodia in a proposition to discover the reality concerning this remarkable flora hunger suppressant possessions, and have set vastly optimistic statements on its results. When choosing a hoodia product it is important to look for a high quality product from a reputable company. The vital element of Hoodia that seems to suppress appetite is a molecule identified by Phytopharm Labs as P57. The one thing I've learned researching the hoodia market now for over two years is that most are a waste of money.